I am looking forward to having Jemima, “Tied with a Ribbon” back to teach at Cotton Rose and to share with us her new book Quilt Big. 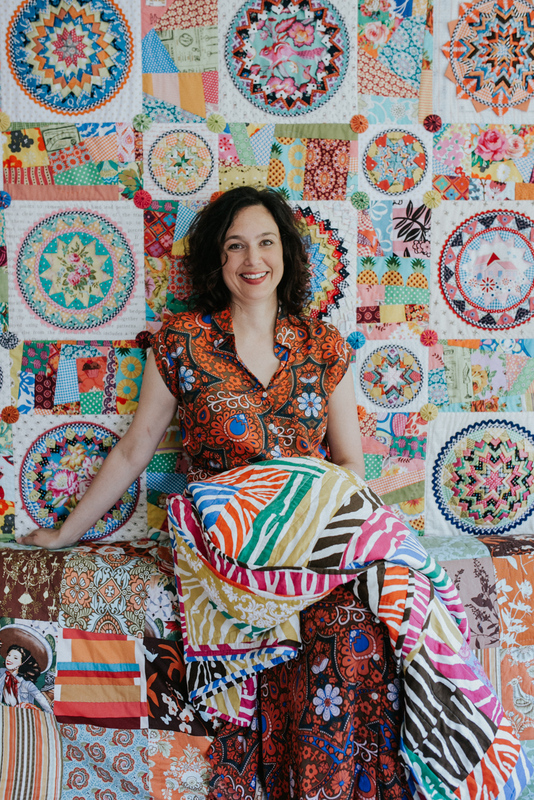 The day consists of a Trunk Show in the morning, showcasing the new book and all the beautiful quilts from the book, the trunk show will be followed by a workshop, we have chosen the Mosaic Quilt from her book. 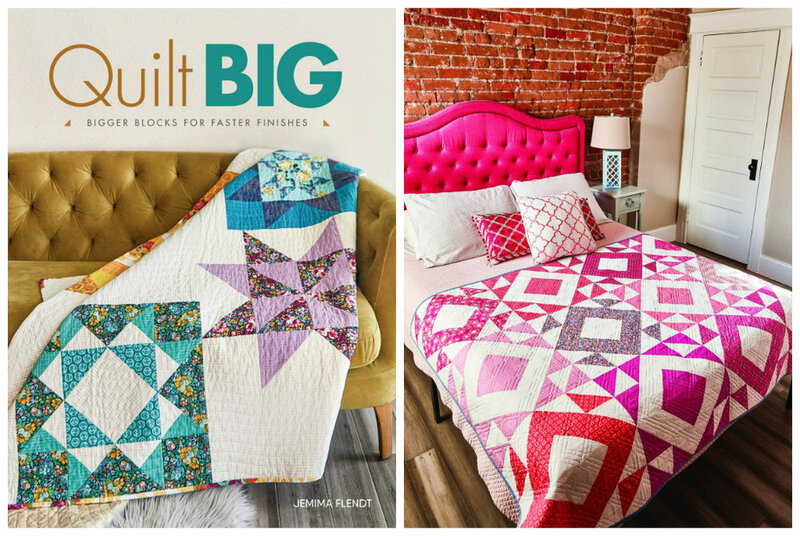 Jemima has many tips and tricks to creating the perfect quilt, her new book is fantastic and full of fun makes that will make up very quickly and look super effective. Come and spend a day being inspired and learning new things. A light lunch, morning and afternoon tea will be provided on the day. You will need Jemima’s book Quilt Big to use for the class. It is with much excitement that Michelle Marvig will be teaching at Cotton Rose. Michelle has been teaching patchwork techniques for over 26 years. She loves building on her students abilities in a variety of ways. Michelle started in the industry 26 years ago making sample quilts for a fabric wholesaler, since then she has had 100’s of quilts published in magazines, written three books, designed multiple fabric ranges and the list goes on. This is an absolute privilege to have Michelle come to the South West and teach and I just know we will learn so very much from her. Come along and share in this special event. A light lunch, morning and afternoon tea will be provided on the day. Lisa is coming back to Cotton Rose for one day only. I am so looking forward to Lisa’s visit, her classes are simply beautiful and to spend time with her again will be awesome. I have added below Lisa’s description of her slow stitching, this is a lovely class and a great way to spend some time learning something new or just sitting and sewing on a Lisa project you have already started from her last visit. and mend” and “waste not, want not” ethos of yesteryear. It is a nod to the generations that came before ours in which reusing and recycling were necessary and admirable. Thursday 25th and Friday 26th of July. Irene taught at Cotton Rose last year and we all gained so much knowledge with her approach to appliqué and to see her beautiful quilts in real life was inspiring. Please have a look at the attached link to see which one of Irene’s quilts you would like to do and please let me know at time of booking, she is happy to teach you any of her quilts but would like to know in advance so that she can bring that quilt. In this class Irene will show you how she appliqués and designs her quilts, come along to learn some fabulous techniques. A light lunch, morning and afternoon tea will be provided on the day. I have been admiring Lindsey Rae’s work for some time now and have wanted to attend one of these classes myself, so to have her teach at Cotton Rose is awesome! In the two day workshop you will build confidence and learn how to make a handmade wardrobe that is Fit to Flatter YOU. This two day workshop will walk you through how to measure, trace, alter and complete a perfectly fitting garment from a standard sewing pattern. A light lunch, morning and afternoon tea will be provided on the day. * How to measure properly and pick their correct size. * How to trace a design and grade between sizes. * Zipper insertion, hemming and finishing techniques. * Pattern alterations and so much more. The class size will be capped at 8 for this class so be sure to secure your place.